Coffin Case's G185 Univerisal Electric Guitar Case offers great protection for your instrument. Featuring a large neck compartment, reinforced wood cross bracing, and thick road resistant black PVC exterior, you know this case is trustworthy for securing your prized guitar. Fitting most body syles, the G185 Universal from Coffin Case has a red high grade diamond stitched velvet interior with improved shock-resistant velvet pillow to insure better fit. Coffin Case G185 Universal Features Great fit to protect most guitar body styles Large neck compartment Reinforced wood cross bracing Durable thick road resistant black PVC exterior Red high grade diamond stitched velvet interior Improved shock-resistant velvet pillow for better fit. 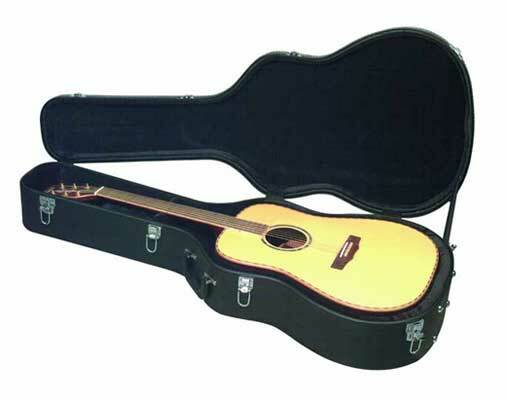 Now an elegant, tough, wood hardshell case for your dreadnought acoustic guitar is more affordable than ever. We love this case - and so do the dozens of guitar players who've already picked one up from us. Top quality construction - great value. Protect the investment you've made in your guitar - without breaking the bank! AMS always seeks out not only the hottest new gear but products that deliver maximum bang-for-your-buck. This Rockcase acoustic guitar case fits the bill. Features rugged .20 inch (5mm) wood case inside material: black velvet, stitched all around two solid lockable snap locks and two non-lockable snap locks sturdy handle with metal insert, covered with vintage leather metal feet solid wide neck supportin area with extra padding; thick foam padding on the inside of the lid separate inside compartment with lid chrome-plated Rockcase logo. 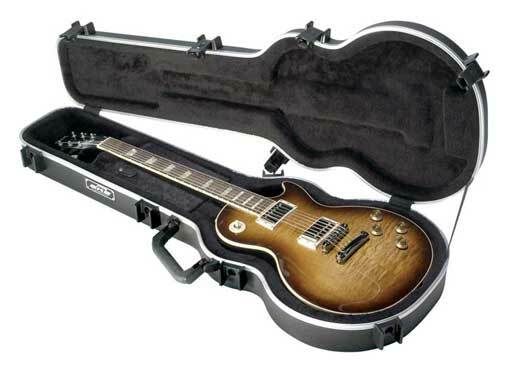 The SKB Molded LP Guitar Case is here to protect your Gibson, Epiphone or other LP Guitar. This SKB case has been designed to fit LP type instruments. The specially molded interior grips the guitar to provide the protection required by today's active musician who plays many different venues with various transportation requirements. SKB LP Guitar Case Features New fiberglass reinforced nylon trigger release latching system TSA recognized and accepted locks Bumper protected valance Injection molded feet Indestructible cushioned rubber over-molded handle Full length neck support Rigid EPS foam interiors to keep guitar from slipping.